(From Pentax lens literature) The Pentax SMC P-FA J 18-35mm ƒ/4-5.6 AL is an ideal entry-level zoom lens designed to be used with fully automatic cameras. Its lightweight design makes it easy to handle and maneuver. It features aspherical lens elements to help transmit light more efficiently and our acclaimed SMC multi-layer coating to lower surface reflection, reduce ultraviolet rays, and deliver clear, high-contrast images. The 18-35mm ƒ/4-5.6 wide angle zoom lens was initially a kit lens option for the *ist series of dSLR cameras. The lens has now been discontinued, replaced in the lineup by the APS-C sized 16-45mm ƒ/4 ED. The lens name bears a long list of standards. SMC stands for Pentax's proprietary ''super multi-coating''; AL represents the lens' use of aspherical lens elements; FA explains the lens is autofocus-enabled, with a digital chip in the lens; and the J designation explains the lens is part of Pentax's budget series of lenses, with a plastic lens mount and no aperture ring. Small and light, the 18-35mm represents a field of view of approximately 28-53mm in 35mm terms. It uses a full 35mm imaging circle, and thus will work without vignetting on a Pentax film body (though the body must be able to set lens aperture to work properly). The lens shipped with a large petal-shaped hood. It is widely available used, and is still available online from some retailers for as low as $150. The 18-35mm ƒ/4-5.6 shows good results for sharpness. At wide angle (18mm) the lens shows good central sharpness, however our sample seemed to favor the bottom of the frame. Wide open at ƒ/4, corner softness is fairly light at 2.5 units: in our sample it shows only in the top-right corner, while the other corners are sharper. Stopping down the lens produces better results, with optimal wide-angle sharpness appearing at ƒ/11. Performance at other focal lengths is a mixed bag; zoomed in to 35mm, the lens performs as well as at wide angle, but at the focal lengths inbetween, the lens shows slightly less sharp results. Blurring in the corners at the widest apertures at 24 or 29mm approaches 5 units. Again, this shows up in our sample in the top-right corner. In summary, the lens gives acceptable results when stopped down to ƒ/11, but outside this aperture you'll see some corner softness issues. Given the off-center nature of the image sharpness results, quality control in this category of lens may not approach that of other Pentax lenses. Chromatic aberration is present but stable for this lens, showing up in the corners at 6/100ths of a percent of frame height at all focal lengths and apertures. We've seen worse, especially for wide angle lenses, and at least you won't have to worry about using one focal length or aperture over another in an effort to reduce CA. Corner shading is typically a problem for wide angle lenses, but the 18-35mm ƒ/4-5.6 deals with it well - at least, on a digital SLR body. Its worst result shows at wide angle (18mm at ƒ/4), where the corners are 2/3 of a stop darker than the central region of the frame. At any other focal length and aperture combination larger than ƒ/8, corner shading doesn't exceed a half-stop of difference, and at ƒ/8 and smaller, corner shading is negligible. Curiously, at 35mm and ƒ/32, corner shading is slightly more evident, at 1/3 of a stop darker. Distortion is a factor with all wide-angle lenses, but the 18-35mm ƒ/4-5.6 handles distortion quite gracefully, showing a maximum of 0.75% barrel distortion in the corners at 18mm. This distortion decreases without any surprises to 0.4% barrel at 35mm. The distortion is linear and uncomplicated, meaning it should be fairly easy to correct in image post-processing software should it be a problem for your straight lines. Autofocus timing depends largely on the body the lens is mounted to, as the lens is mechanically driven with a screw. On a K100D Super, the lens is surprisingly quick to focus, at less than one second to rack through the entire range. Being mechanically driven, the lens does make some noise while the lens does a full-range focus. Point to point focusing on the K100D Super is very quick, and comparatively silent. 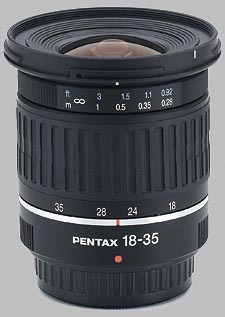 The Pentax 18-35mm ƒ/4-5.6 isn't a dedicated macro lens, and this shows in its maximum magnification of 0.18x and close-focusing distance of 28cm (around 10 inches). There are better dedicated lenses. Pentax only released three lenses in the FA-J series. While I have no evidence of quality control issues for the series, Pentax has clearly had second thoughts about them, as all three have now been discontinued. In the lens' favor, the use of plastic for a lens mount (and presumably some of the lens' internal workings) produced a very light product that focuses extremely quickly. 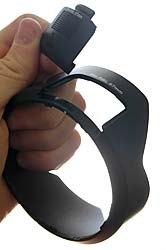 The zoom and focus rings are still very solid and robust, with an excellent texturized grip. Perks have been removed from this budget line of lens: the only feature is a distance scale, etched into the focus ring. That said, the lens hood has a Pentax exclusive feature which I'm quite fond of, a removable section which allows access to turn a front-mounted polarizing filter. The lens accepts 67mm filters, which don't turn while the lens focuses or zooms. Both the focus and zoom rings run through their ranges in just short of a quarter-turn. 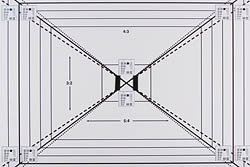 Most of the lens' real estate is taken up by the zoom ring. Turning the zoom ring produces a slight amount of lens extension through the middle focal range of the lens, but no more than a half-inch. Zoom creep is not a factor for this lens. 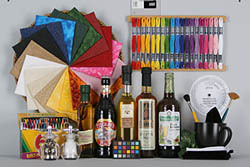 Manual focus is accomplished by selecting it as an option on the body; when set to autofocus, manual focus is impossible (the lens is not equipped with Pentax's ''quick-shift'' technology, which allows full-time manual override of focus). We haven't tested the successor for the 18-35mm lens, but on paper, it's much more capable; a constant ƒ/4 aperture, a slightly wider and more telephoto zoom range, and technical features like the quick-shift focus system. The pro version of this focal length of lens, it hasn't hit our lab yet but it's got the most impressive selection of lens denominations yet. The Sigma equivalent of this lens is slightly faster (ƒ/2.8-4) and regularly boasts HSM technology, however, the Pentax version of the lens does not. With a 35mm imaging circle, the lens is backwards-compatible with film bodies. We've tested this lens, and found it to be extraordinarily soft in the corners when used wide open. Stopped down, it's a little better, but for the money, you're much better served by the Pentax equivalent. Chromatic aberration is worse, but vignetting is better controlled. As Pentax moves towards more APS-C lenses, Pentax system users who want backwards compatibility with their film bodies will be well-served by this lens, assuming the body in question allows the setting of the lens aperture. I would speculate performance of the 18-35mm ƒ/4-5.6 would be slightly poorer on a film body, as the digital sensor is focusing on the sweet spot of the lens. For the money, the lens doesn't knock one's socks off, but it does exceed expectations. This lens is truly spectacular! I read the first review and I think the author has some f/b focus issues on his K10, the lens hasn't any distortion or vignetting, either wide open. Is light and fast and accurate on focussing. Photos taken with this lens are indistinguible from the ones I take with the 16-45mm. And it is light! Less than 200gr. Ok, this is a filmsy lens but who cares? If for an hand of bucks you got a lens that matches the 16-45 and is extremely sharp from corner to corner, from the first stops. And best of all when you mount it on a MZ camera you got an outstanding 18mm nearly whitout geometric distortion. I think that Pentax stopped to produce this beauty becouse they are afraid by its concurrency against the old 20-35 and the new 16-45... Look at the magazines no one has put on their pages a test of this beauty, I suspect Pentax has never send a copy of this to the magazine, But they decide to boundle it in the *ist project, and we know how much pentax has worked on the *istD. If this lens has been prouposed at the Pentax ist launch in a boundle at near 2000$ surely it an't be a bottle of coke. At the Pentax ist DS this lens works good, but not at the K 10. So the limit is 6 MP. The lens offers real 18mm but on the long end it´s getting dark (f 5,6). At 18mm it shows strong extreme corner shading and a bit distortion - all in all a quiete acceptable middle-class-lens and very light-wight.